My favourite XLL tool just got updated. I decided ages ago that xll+ was the best way forward for C++ xlls. The main reason was its ability to target both 2007+ and classic Excels from the same file. Hand coding that in C++ is a PITA. I am still awaiting my first commercial 2010 job, and I am looking forward to a couple of new 2010 features, the main one being the compute cluster integration (native async). XLL plus 7 helps you target that exact functionality, neat. This version also has Ribbon integration which is great because the native xll interface does not support any ribbon interaction meaning normal xlls become a 2 file solution in 2007+ as you need a workbook/xlam to hold the ribbon customisations. Which was a bit crap. And this new version of XLL plus also supports 64 bit, which I imagine was a pretty big job. I’m a bit unconvinced about 64 bit Excel personally, if I needed a spreadsheet bigger than 2gb I would take up yoga so I could give myself a kick up the arse. I suppose if it improves RAM use too I could see some value (and avoid all that stretching). Anyway, as a key performance tool provider I guess XLL+ didn’t have much choice, as these big monsters are exactly where you would use XLL+. Anyway I haven’t even downloaded a copy of 7 yet so I haven’t had chance to try it, I’ll report back when I have. I got a linked in notification that one of my contacts had an updated profile, as the train left Genève. I clicked the link, it still hadn’t loaded by Nyon. Thats 30 km or about 10 mins, to load 1 (small text) page, well not load, in fact. Of course at Nyon a telecoms provider from a neighbouring country reaches in to try and screw some roaming charges out of us. As this particular contact lives between Genève and Nyon, it would have been quicker to take a horse and cart and call at his house and get the update face à face like in the olden days when everything was black and white. I don’t know what coverage is like by you, but I seem to spend significant time at places with slow or no mobile network coverage. so either I am just a very unlucky cloud client or the infrastructure is not yet quite where it needs to be to fuel the web 2.0 fantasy. Which is it? As I am sure you are all aware I am a little underwhelmed by the current cloud obsession. The other week I got a reminder how much and why I think its a bit oversold. Put simply, if you live in a part of the world where you can travel all day and not change wireless provider then maybe things makes sense, or if your providers have agreed a sensible fee structure. If you live in a part of the world where a couple of hours drive in any direction will put you in a new country, with a new wireless provider, with generally obscene abusive fee schemes then, well the cloud starts to hurt financially. If you live near a bunch of predatory roaming grabbers (Bouygues I’m thinking of you – hijacking my phone whenever I go within 50kms of the French border, even when my home signal is fine) its abruptly not very sensible. If you look at the times I used 8 quid in 2 minutes, thats more than some lawyers cost! In fact I used my 40 quid in a couple of tiny slots, of well under 1 hour in total. And I was just checking my email, a quick glance at Google maps etc. I wasn’t streaming music or films or anything data intensive. The fact is data roaming in Europe is painfully expensive, so much so it makes the whole thing close to unusable for normal people. If you are wondering why the blog update rate took a nose dive in April there is your answer, and its going to be like that till the End of May earliest. 40 quid to download a bunch of spam is a lesson learnt! 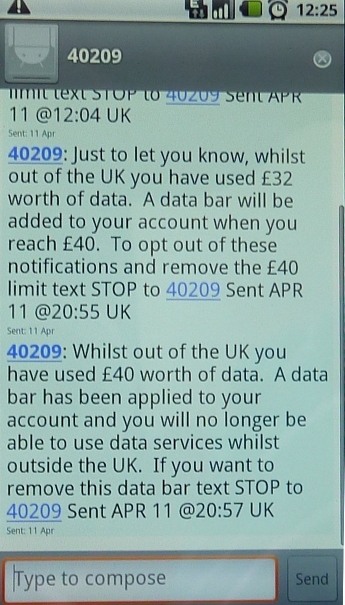 Have you been burnt by data roaming? I asked around a month or two ago if people would be interested in my organising another of these events, and a few people were. However having weighed up the challenge, and the stack of other stuff I have on I have decided I don’t have the capacity this spring/summer. Sorry to those who expressed an interest. If someone else is willing to organise something I would be happy to help out with advice and could probably present if required, but I don’t have the capacity to sort the whole thing out this time around. I heard a rumour there might be some sort of event in the autumn, so hopefully we can all meet up then for the traditional beers. as usual not because I have run out of stuff to say. just lack of time and internet access in particular. I am currently working in the sunny Netherlands. There are lots of good things about that, but internet access isn’t one of them. Turns out my credit card company refuse to allow me to buy credit for my internet dongle, which makes getting on-line a bit of a challenge. I have a few minute spare in between taxiing the kids around and fixing broken toys to fire out a quick post. so this was it. I hope you are having a good time where ever you are and what ever you are up to.